On the street, in the dirt, on the water or in the snow, VARTA® AGM batteries are ready to get you riding – right now. They come fully charged. That means you don’t have to mess with measuring acid, pouring it into the battery, and charging the battery yourself – a process that can take eight hours. VARTA AGM batteries are ready to install, hook up and go. Their Absorbent Glass Mat (AGM) technology helps make them stronger, vibration-resistant and spill-proof. And every model is purpose-built to provide highly efficient and long-lasting power for whatever it is you ride. Does this Battery Fit Your Vehicle? No measuring, pouring or initial charge required. 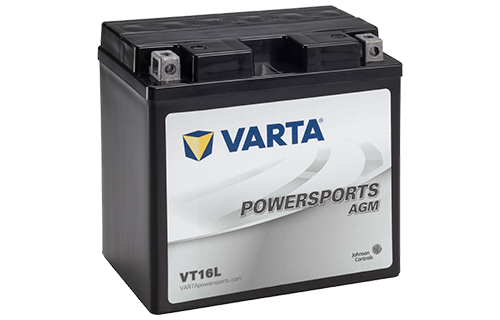 VARTA® AGM batteries come precision charged and permanently sealed from the factory. They are ready to be installed and ready to power your engine immediately out of the box. This is a huge advantage over traditional “dry-charge” batteries. Dry-charge batteries are not "ready to ride" off the shelf. They come with a kit, which requires you to perform several steps before your battery is ready to work. First, you carefully measure the battery acid (some kits come premeasured). Next, you pour the acid into the proper battery vials. Then you seal the battery. And finally, you charge the battery. Depending on the model, charging time can take eight hours. That’s many hours spent not riding.